a2b Fulfillment will be a Contender Prime Sponsor at the Eighth Annual Georgia Logistics Summit. 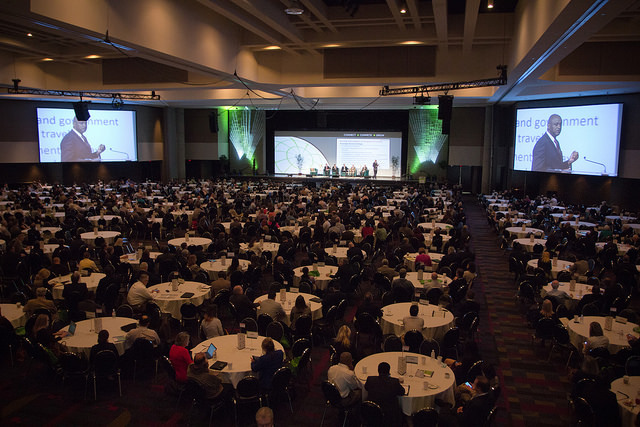 The event is hosted by the Center of Innovation for Logistics on April 19th and 20th at the Georgia World Congress Center in Atlanta, Ga.
Last year more than 2000 attendees representing 30 states and nine different nations attended the Summit. Many industry leaders are lined up for informative and insightful presentations throughout the event. Summit attendees have an opportunity to interact and share their perspectives on logistics providers, potential service improvements and industry trends. On Day 1 the Summit opens with an overview of the global and national landscape within which Georgia companies operate. This is followed by a review of key points for new and upcoming Federal regulations affecting the logistics industry in energy and workforce issues. That afternoon, five different Roundtable discussions are offered, sharing best practices in key areas for Georgia’s shippers, coupled with relevant discussion among industry leaders. Topics include: risk reduction, assembling logistics success for manufacturing, next generation analytics for supply chains, tackling operational visibility through technology and creating big dollars from small changes. The final session includes an update on new developments, economic growth and opportunities in metro Atlanta, Savanna, Georgia’s other metro areas and rural Georgia. The day concludes with a networking reception in the exhibitor booth area. Attendees will have time to visit the many exhibitors who offer valuable services to the logistics industry in Georgia. Visit with a2b Fulfillment personnel, who will be happy to demonstrate how a2b Fulfillment can be part of a logistics program in Georgia. The networking event is an excellent opportunity to make strategic relationships. Day 2 opens with breakfast and the annual address by Georgia’s Governor. This is followed by a robust roundtable of experts discussing hot topics in all of Georgia’s transportation modes: trucking, rail, air and ocean. Additional sessions and networking opportunities fill out the morning. The program concludes with lunch and the keynote speaker, Frank Crespo, VP and Chief Procurement Officer for Caterpillar.